Zhelle.Dk: What happened to the last couple of months? What happened to the last couple of months? I have absolutely no idea what I've been doing since I last wrote here. Well I sort of know: holiday in Wales (which I was sure I wrote about), working, visiting friends, watching tv series. Do you know the feeling that when you're in the moment you feel busy all the time but looking back over a period of time you feel like you've done nothing? By nothing in this context I of course mean being crafty or making patterns! 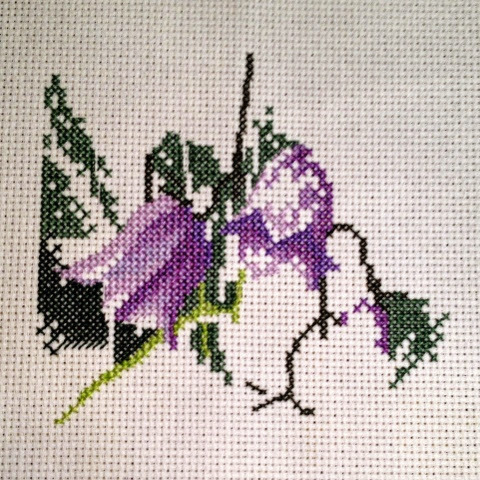 I have started stitching John Claytons Harebell Panel and have gotten quite a few stitches I to it. I have copied the original chart and using a highlighter to mark what I've stitched. It's stitching up a lot quicker when I'm doing it like that! I'm determined to update the blog more often! And hopefully my computer isn't completely dead (we've hit a little glitch tonight which the Apple support will hopefully fix tomorrow) so there will be some new patterns in my Etsy shop soon!